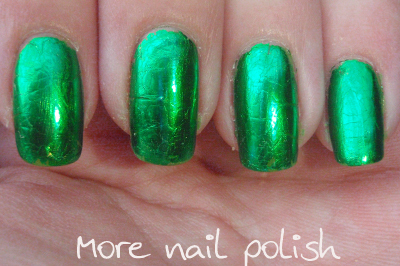 If ever there is a day where you can go crazy with green polish, it is today. I actually don't have many green polishes, and the ones that I do have aren't that pretty (think Ulta 3 Frog Prince and Jelly). So instead I decided to apply some green foils. I can't imagine I would ever wear this colour foil normally, except maybe at Christmas. I'm totally loving foils. I'm getting heaps better at applying them now and have found a good top coat that doesn't wrinkle up the foil too much. Even still, they don't last much longer than a day or so. But that is fine with me cause I've been changing my polish everyday anyway. Happy St Patrick's day everyone.